Kirgistano namai nėra išvaizdūs. | Houses here are not particularly beautiful. Crossing Uzbekistan – Kyrgyzstan border is one of the easiest steps in Middle Asia countries – no painful documentation filling. Show the visa and straight into the country. Just as we have entered the new land, a dark car has stopped and we had couple seconds to decide whether it is safe enough to get in. We made it and the risk was worth it. Aldynbek – which appeared to be a policeman – has given us a full on tour around the city. ‘These are the left-over buildings after the Osh war in the summer of 2010′ he showed us the ghostly looking black buildings. 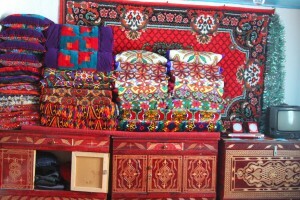 They were Uzbeki houses and shops. ‘Have you taken part in it?’ we dared to ask. ‘Of course! This is my country. We are very democratic country. If we don’t like something, we have to show it’. 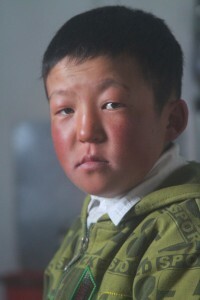 He blamed Uzbeki people to be the ones to ignite the conflict and Kyrgyzs bravely responding to it. However French workers in international aid organisation Acted revealed another side of the conflict. It appears that Kyrgyz people recently became very nationalistic, and they wanted Uzebki people out of the area despite the fact they have been living there for ages. There is a dark side business factor too. It seems they wanted to overtake drug business too, hence you will see some monster cars in the town which perhaps were bought for dirty money. Aldynbek was a slow person but with a sharp mind and even sharper humour. Soon we enjoyed his patrtiotic enthusiasm. He brought us up on the Suleiman hill covered in heavy fog that day. This hill is famous not only for local lovers coming for a date, but a place for pilgrimages and prayers to restore the fertility. His hospitality did not end right there. 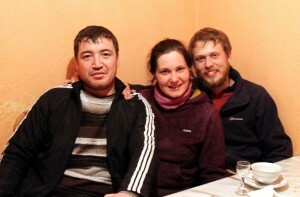 He booked a hostel for us and hosted with a kyrgyz dinner in the cozy restaurant. 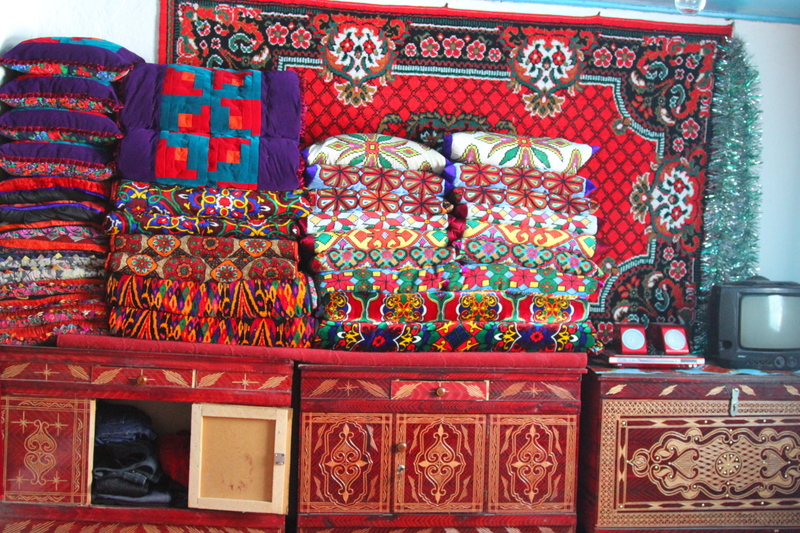 The first impression of Kyrgyz hospitality was impressive. Vaišinęs ir hotely mums nupirkęs begalinio dosnumo policininkas Oš mieste. 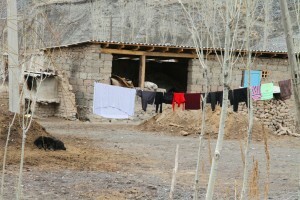 | Our super hospitable policeman in Osh. The next day we were up on the feet to travel to Erkechtam, the border town in order to cross China as soon as possible as our entry date for Chinese visa was soon to expire. On the way though we thought to stop and spend a day in a valley near a river surrounded by Tian Shan mountains. No alpinist ambitions, but we surely wanted to hike there to feel the atmosphere. The old man in a long 2-blade beard has waived hi to us when we pitched the tents and were ready to graze our eyes on higher views. The literally breath taking ascend was rewarded. We dared to challenge few steep wet rocks at the top, and after hard all the way up work we sat down in peace. The night underneath the moon around the bonfire eating our simple dinner was another price for the day’s adventure. The next day we slowly moved further. 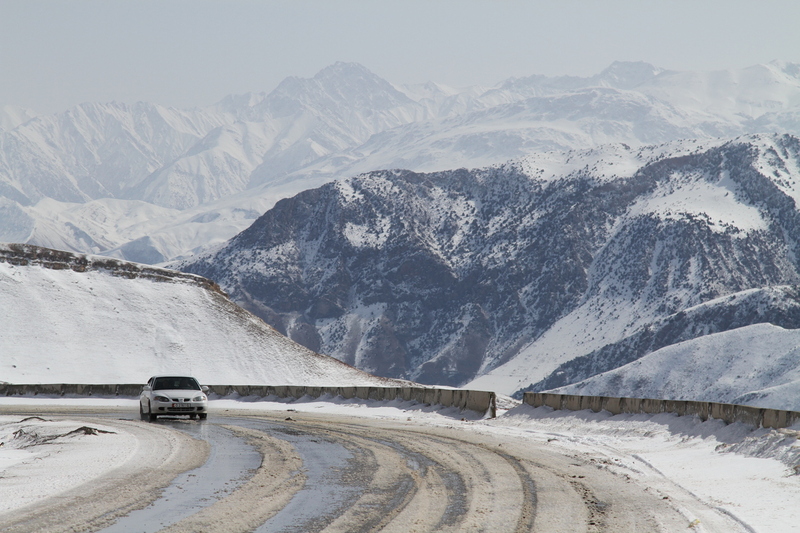 Finally the truck struggling through all the snow got us to Sary Tash town up high, where not only beauty of the Tianshan peaks but the altitude made us slightly dizzy. 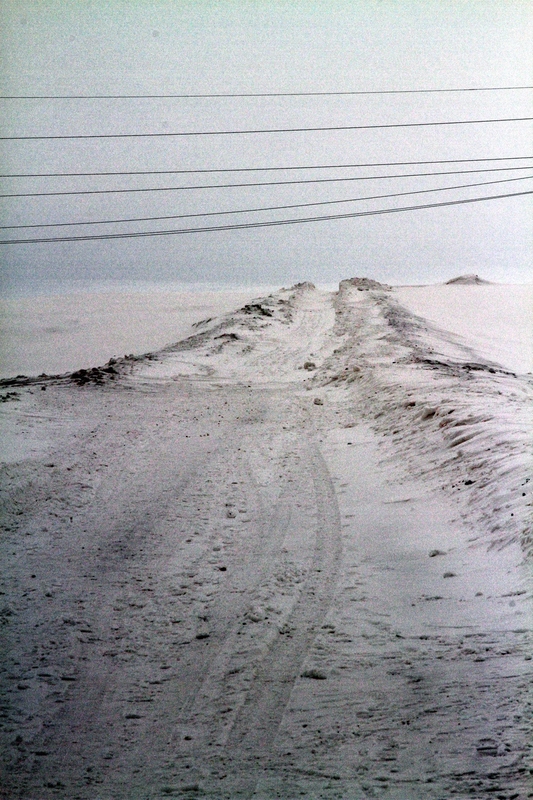 The town was all buried in deep snow. An old style fuel station operator gave us pessmistic facts and predictions. 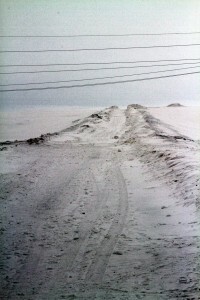 Blizzards had been cruel recntly, and three days when nobody can cross the mountain road to Erkechtam. Nobody knows when the weather will clear up, and neither how long the cleaning process will take place. We could hardly see the difference between the sky and the earth. ‘Don’t go any further’ warned us one old man. ‘Few months ago two young people ignored the rough condiions and decided to reach the border independently. One died on the way’. We did not intend to do it anyways. We knew the wild nature might have been awake too in those harsh conditions. The only option had been left to us, and that is to wait patiently. When few people promised to host us for free, we got lured into English teacher’s house only after realising that this stay is not going to be for free. And neither other 4 nights we stayed in this village as it seems this place is a very touristic place where compassion is non existant. We did not have much money so people could not benefit much. We realised more and more, that we cannot experience the true hospitality and interest in people when the money comes into the game. The enthusiasm on getting to know each is other is low. On the other hand we had no much choice – the blizzards were harsh, and a tent was a poor option. At least we had few days of relax stay in the peace and had magnificent walks where the high moutains all in white were in their beauty.The days passed and our hopes to get to China soon were shrinking. Despite the sunshine, the road was still closed for quite some time. We soon had to invent another plan to get to China. Kirgizų vaikai. | Kyrgystan's kids. Our plan meant to reach the capital city as soon as possible, and make Kazach visa over there, and do Chinese one in Almaty. The recent blizzards were nasty. The avalanches on the only Osh-Bishkek road meant we have to wait once again. Luckily we could couchsurf at Prad’s place where we had a chance to meet up with some french and american aid workers, who told few ins and outs of the their work. Once we got to Bishkek, the time slowed down again. Instead of gloomy visa waiting in the capital, we soon hitched a thumb to a pearl of Kyrgyztan as they call it. Ysyk Kul lake surely was a pride of it all. The massive lake, surrounded by snowpeaked mountains, looked mysterious. The camping there was a heavenly pleasure. Mėgstama margalynė ir spalvos. | Colourfulnes and bright colours are widely used here. One night when were about to pitch the tents thinking we are all in solitude in the middle of nowhere, a ghostly looking man was walking towards us along the lake. The moon shone brightly hence soon we could see his full picture. His clothing looked tidy, he wore glasses and looked a typical comical character from old Russian movies. In Russian Igor started to shout from afar: ‘I thought I am the only romantic down here. But hell you are romantic too. You know if I was to die, this is the right place. This is the paradise on earth’. He was clearly drunk but moderately, as he was still able to talk clearly and often philosophically. We soon to realize he was thrown out from home by his wife who was not too happy about his recent behaviour. In his hands he had a plastic bag with two plastic bottles of home made wine and two glases. He immediately poured some wine to us, and we had to admit it was a good quality drink made by his mother-in-law. Whilst we collected some wood, pitched the tents and prepared the food he was non stop philosophing and quite wisely about love and life. It was still pretty cold, so we offered him one of our tents. Soon he layed down and snored heavily. At night he was talking loudly, making quite a mess in a tent, and in the morning disappeared as mystically as appeared. We would have thought it was an illussion or so but Igor’s left glasses on the rock and empty bottles of delicious wine were laying there. The lengthy nearly 2 week waiting process of Kazachstan and new Chinese visa finally was over. We had to admit we were lucky enough to be hosted by few people in Bishkek who made our city stay managable. Couchsurfers Irene and then David were incredibly fast to respond to our request, so we did not need to stay in the park. We were surprised to be hosted by some fellow Lithuanians who immediately offered us a good shower, our celebratory ‘3 months on the road’ dinner and a full wash of our clothing before we set off to East. Once we had the painful visas in the pocket, we head to Kazachstan with no major expectations.